Bike Lanes on Beulah Road in Fairfax County. Image by Elvert Barnes licensed under Creative Commons. Fairfax County will be laying down over 19 miles of new bike lanes over the next few months, and they're going to go all over the county, from Reston to Mount Vernon. This map and list will show you where they'll go. Fairfax will add the new bike lanes as part of its road maintenance and re-paving season, as transportation planners have an opportunity to see whether a road can be repainted with bike lanes. The program has been around for about ten years, but got a real boost in 2013 thanks to that year's transportation bill that provided more money for road maintenance. That gave planners in Fairfax County the chance to work with the Virginia Department of Transportation (VDOT) on finding roads that could be redesigned to include bike lanes. This year includes a mix of bike lanes, buffered bike lanes, climbing lanes that give cyclists going up hill a break; and sharrows for cyclists headed downhill. Where Fairfax County is building new bike lanes. Click to see an interactive map. Image by Dan Reed. Before 2015 the county had only added a few miles of bike lanes, but since then that number has exploded. 2016 saw 16 lane miles (one mile of bike lanes in both directions counts as two lane miles) of new bike lanes and 2015 saw 26 lane miles. With 2017's additions, Fairfax County will have around 140 lane miles of bike lanes. This is a great way to build out a bike network over time, says Jeff Anderson, president of the Fairfax Alliance for Better Bicycling (FABB). He notes that the bike lanes are essentially free to build, since the road is already being repaved and repainted with new stripes. FABB also helps let people know about which roads are slated for repaving and may be eligible for bike lanes. That way people can go to public meetings, learn more about the proposed bike lanes, and show county leaders their support. That support can be crucial when some resident protests about parking or safety could stop the county from adding bike lanes along a certain street. That was almost the case on Rose Hill Lane in Springfield, but bike lane supporters were able to convince both their neighbors who bike and county planners that bike lanes will benefit the entire community. 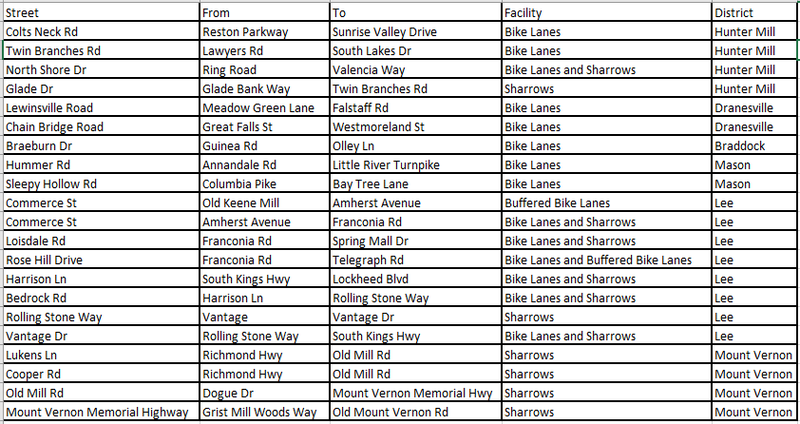 A table of the roads getting bike lanes in Fairfax this year, listed by district. Image by the author. One important bike lane is going to be striped along Hummer Road in Annandale. The bike lanes along Hummer will connect to existing bike lanes on Annandale Road and Heritage Drive, making a five-mile long corridor that's one of the longest on-street bike routes in the region. Other bicycle projects are in the works. New wayfinding signs are being installed all over the county to help cyclists figure out good routes to get to where they want to go. In addition, Capital Bikeshare stations are already up and running in Tysons Corner and Reston, and a second phase will add ten more stations to the network. Bike lanes are becoming a common sight around all of Fairfax County, and it's all because the county looks at whether it can paint new bike lanes whenever it repaves a street. Have you used any of the new bike lanes in Fairfax? Let us know in the comments.